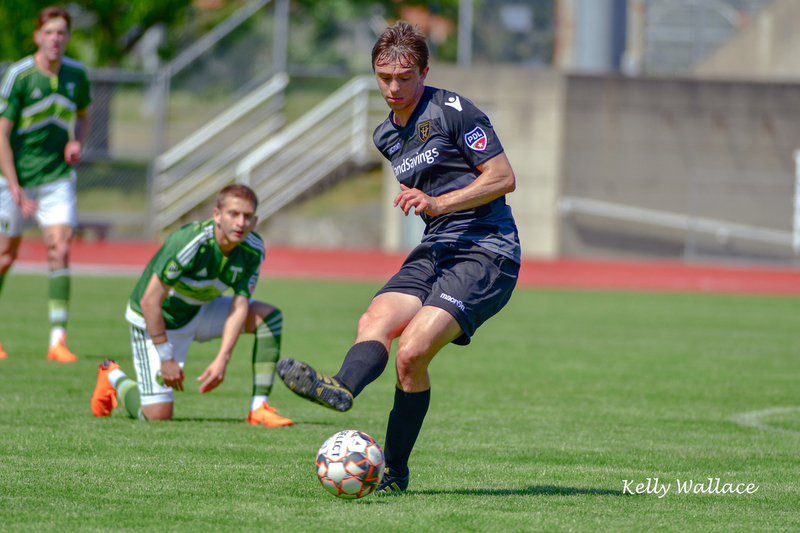 VICTORIA, BC - Victoria Highlanders FC (4-8-0) travel south of the border to take on Portland Timbers U-23 (3-8-2) in Week 11 of the Premier Development League (PDL) regular season, July 11 (6:30 PM PST KO) at McCulloch Stadium in Salem, Oregon. The Highlanders go on the road following a tough 3-1 loss versus Washington side Sounders U-23. Looking to end the season strong, the Highlanders travel to Salem, Oregon to take on Timbers U-23. The match will be streamed online through the Timbers U-23’s Official Youtube Channel. Following a tough start to the season the Highlanders have found their stride despite a 3-1 loss on the weekend. Victoria traveled down to Sumner, Washington on Friday night where they took on Sounders U-23. In a clash to move level on points at second place, the home team came out on top. Sounders hit first scoring a brace before 25-minutes. The Highlanders were able to bounce back with a lovely cross from Cam Hundal that was met by a volley from Mitchell Popadynetz. Victoria found their momentum with the goal but were unable to find an equalizer. A second goal from Sounders U-23’s top goalscorer Santiago Patino sealed the game. With two games left in the 2018 regular season the Highlanders aim to end the season with maximum points. Victoria will travel down to Oregon Wednesday, to look for three points at McCulloch Stadium ahead of their final home match at Centennial Stadium this Saturday. Portland Timbers U-23 host the Highlanders desperately in need of a win. Timbers U-23 are heading into this Wednesday night clash looking to snap a four game losing streak. Sitting bottom of the table the Timbers U-23 side lost Friday, June 29 to Lane United FC 5-0. This was followed by a 4-0 loss to Sounders U-23 on Tuesday, July 3. Most recently Timbers have lost to TSS FC Rovers with a score of 2-0 and are coming off a tight 1-0 loss to the division leaders Calgary Foothills FC. Despite the results the Timbers U-23 side are not to be taken lightly as the PDL Northwest Division has proved year after year. Timbers will be hosting Victoria in their final home match of the 2018 season and will be looking to grab three points in front of their home crowd. In the 2018 regular season three game series between Portland and Victoria the American side holds the advantage with two wins out of two so far. On Sunday, May 20 at Centennial Stadium, Timbers U-23 traveled to Victoria to take on the Vancouver Island side. In a highly contested matchup the difference was found at 77-minutes with a goal from Portland’s Gio Magana-Rivera with a lovely curled effort far post to end the game 1-0. Victoria traveled to Portland for the second game of the series Sunday, June 24 losing out 2-1 in another closely contested match. A brace from Portland’s Blake Bodily at 21-minutes and 65-minutes made for a tough afternoon. Victoria’s Francesco Bartolillo scored at 73-minutes to cut the lead in half. However, Highlanders were unable to find an equalizer and now look for revenge Wednesday night in Salem, Oregon. The Highlanders return to UVic’s Centennial Stadium for their final game of the 2018 regular season Saturday, July 14 at 2:00pm. We want to end the season strong, so grab a friend and come out to Centennial to enjoy a great atmosphere! Tickets are available at www.highlandersfc.ca/tickets. For more information, please visit www.highlandersfc.ca.